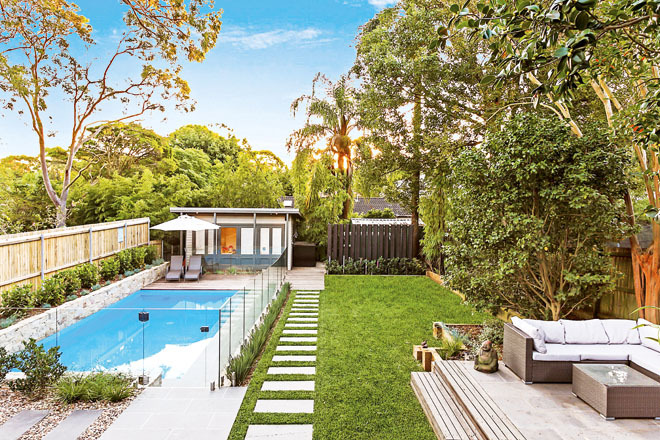 With its lush planting and multiple entertaining areas, this garden on Sydney’s North Shore is now a place of refuge. 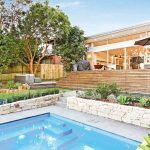 Making the most of the sloping site, Urban Escape Landscapes & Pools took the opportunity to not only design a beautiful garden, but also a series of usable and versatile spaces. 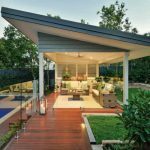 A relaxed outdoor retreat that would be functional but easy-care — somewhere they could enjoy good times with family and friends. 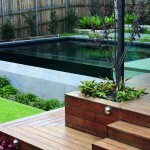 This was the homeowners’ brief. 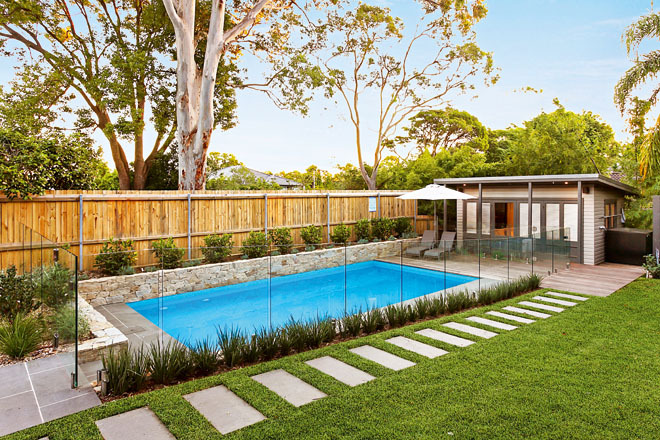 “Spaces to play, swim, chill and entertain were necessities, so we set about creating a multi-functional outdoor area that included a swimming pool, multiple entertaining areas and a free-flowing lawn. 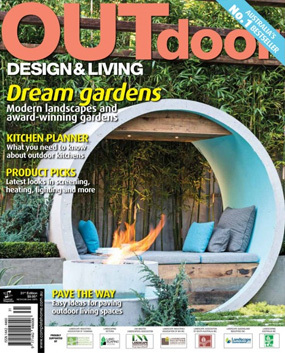 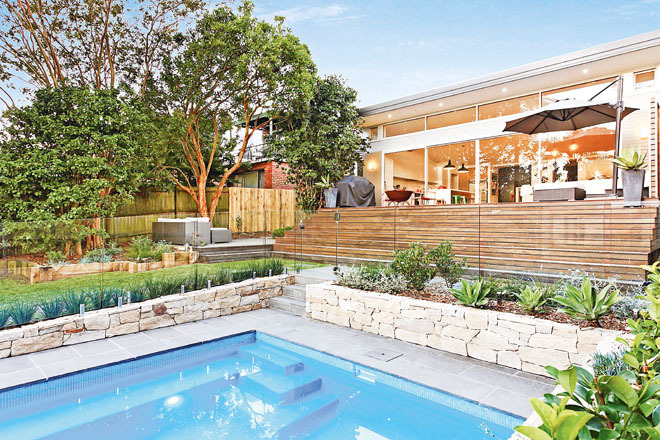 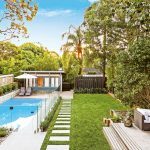 In the process, we also resolved the previously awkward level changes and turned the garden into a family sanctuary,” explains the designer, Nick McCarthy of Urban Escape Landscapes & Pools. 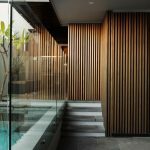 One of the things that make this design work is the mix of contemporary and classic elements and the use of natural materials. 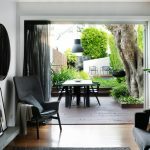 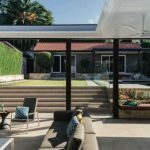 It’s the culmination of these aspects that creates the flow from inside to out and blends the space with the existing landscape and architectural style of the family home. 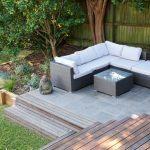 The large deck, which sits at house level and connects to the garden’s lower level via a sweeping set of steps, was built using durable natural hardwood. 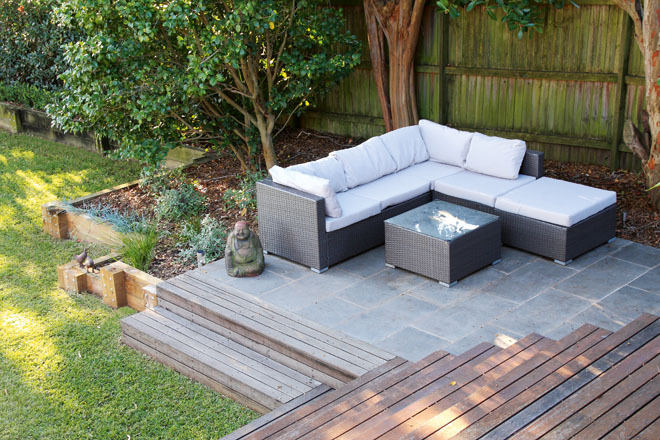 So, too, was the decking in front of the existing cabana. 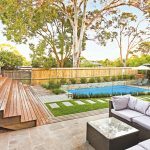 Complementing the timber is the use of natural stone to clad the garden bed beside the pool and a retaining wall that makes the transition between the sloping lawn and the level pool area inconspicuous. 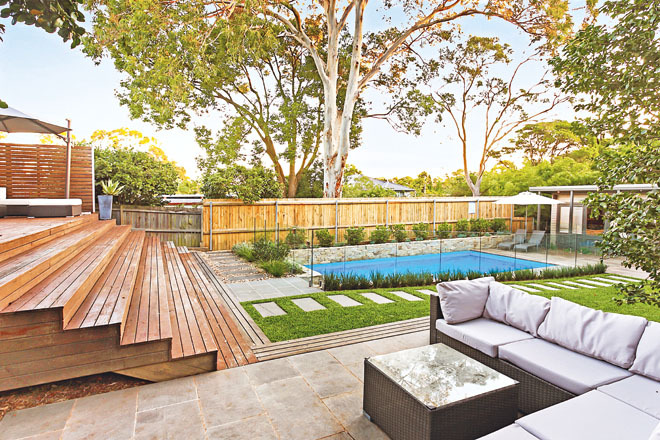 As the house deck is the main entertaining area, a connection was needed between the house, new pool and fire pit area. 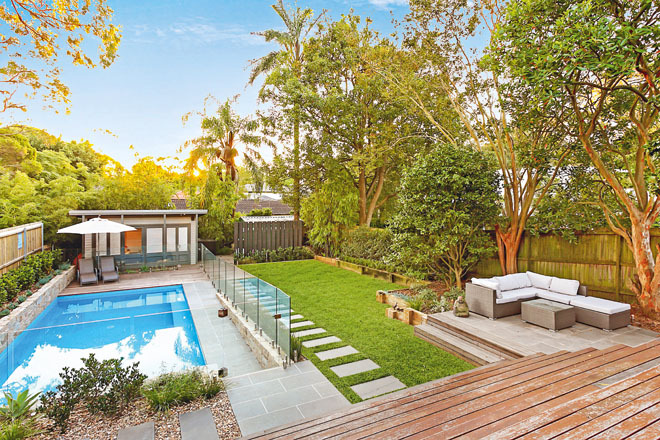 Full-width hardwood timber stairs were employed to physically and aesthetically connect the various outdoor spaces, ensuring a smooth, harmonious flow throughout the landscape. 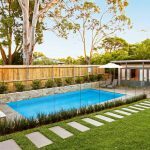 Adding to the classic feel is the use of exfoliated bluestone for the paving, pool coping and the stepping stones that make their way across the lawn. 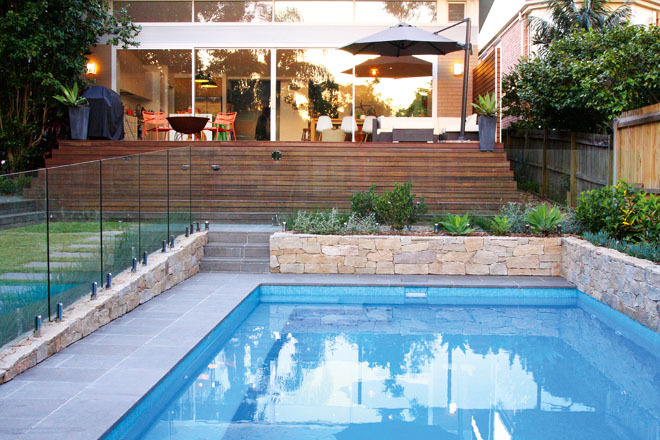 Frameless glass fencing completes the clean look. 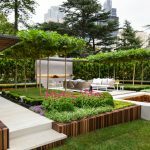 The planting was kept simple and classic with myriad textures, tones and heights creating a space that was appealing and easy-care. 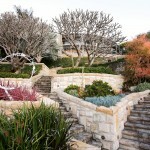 Blue chalk sticks and dianellas were used as small border plants; bamboo and viburnum as hedging and screening. 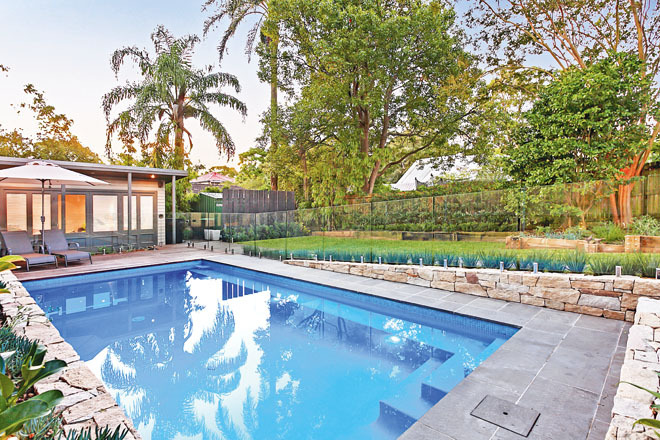 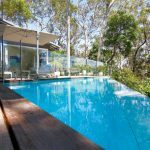 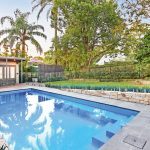 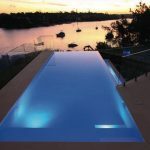 Urban Escape, a boutique company operating in the Sydney metropolitan area, provides a holistic approach to outdoor design by offering both pool construction and landscaping expertise. 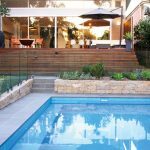 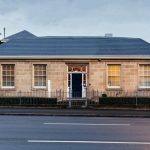 It is also a full-service company that can take any project from design and council submission stage through to final construction.